Thanks, you guys Rock. Great products and excellent customer service. Can’t believe how fast I received my order. Telling all my friends too. Customer “W” Boat Owner. At Hula Boat Care Products we love to hear from our customers. Whether they are restoring gelcoat or fiberglass, removing oxidation, cleaning and conditioning vinyl or just a little hard water spot removal after a day on the water. Read more testimonials from other boat owners and professional detailers. Restoring lost luster, oxidation and scratches from your boat’s gelcoat. Restoring your hull is as easy as 1-2-3 with Hula Boat Care Products. Learn how by using a simple step-by-step gelcoat restoration process. This easy to follow instructional video includes matching Hula Boat Care Products with the appropriate buffing pad as we restore the gelcoat on this Malibu boat. Learn how to restore your gelcoat and get back on the water with eco friendly products that are designed to perform. 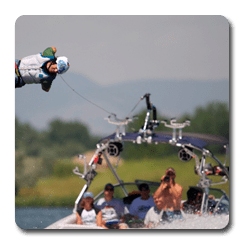 Hula Boat Care continues its support for wakesurfing competitions and the athlete’s that are dedicated to the sport. The following events are scheduled for September and October, 2015. The 8th annual Barrel Boss is here again! This year’s event includes a “few small format changes,” in low pressure grass roots contest for the whole family! The 20th annual centurion boats world wakesurfing championship is the sport’s pinnacle event. Look for strong performances from Team Hula Members. Hula Boat Care Product’s line of boat waxes, vinyl cleaner and conditioner, gel coat compounds, polymer gel coat sealant, polishing products, water spot remover and other boat cleaning and boat maintenance products are designed for performance without harsh chemicals. All of Hula Boat Care products are easy to use and require minimal effort to get lasting results. We create our boat polishing products including our boat compound, boat wax and other marine grade products to be biodegradable, recyclable and environmentally responsible. Over the past 17 years we have had the opportunity to collaborate with leading boat manufacturers, chemists, professional detailers, professional water sport athletes, racers and their support teams. During this time we noticed that most boat care products simply did not provide professional results. We also noticed that most products available for boat polishing, maintenance and care used harsh chemicals. Even worse, many products were re-purposed automotive paint polishing products that were never intended for boat hulls, gel coats or marine vinyl. Hula Boat Care Products line of boat and gel coat polishing products includes a boat compound, cleaner wax, spray detailer, water spot remover, vinyl cleaner and conditioner. Hula Boat Care Products are specifically formulated to provide excellent results with minimal effort – all with eco-friendly ingredients. We share your passion for boating along with a responsibility to our environment. With over 17 years experience in the surface care industry our mission is to provide our customers with eco-friendly and performance driven gel coat compounds, boat wax and marine quality vinyl cleaning and maintenance products. Each boat polishing product enhances our customers experience and exceeds their expectations so they can show off their boats, have fun on the water, and look good doing it. Hula Boat Care products are made with the highest quality ingredients to our precise standards. All of our boat polishing and maintenance products are easy to use and require minimal effort to get lasting results. We create our boat polishing and maintenance products to be biodegradable, recyclable and environmentally responsible. Perfect for Towers, Dashboards, Instruments and Non-Vinyl Surfaces. Evan – Round Rock, TX. To learn more about Hula Boat Products interior care products visit our interior care products page or our online education center. We do not disclose your personal information unless you provide us with written consent or are required by law. We will not sell, rent, or lease your personal information with any individual outside of our company. Your personal information will only be used for the purpose it was collected. About “Cookies” When browsing a website, a cookie identifies only your computer. A cookie is a piece of data stored on a site visitor’s hard drive to help improve your access to the site and identify repeat visitors. For instance, when a cookie is stored to remember you, you would not have to log in a password more than once, thereby saving you time while on our site. Cookies can also enable us to target the interest of our users to enhance their experience on our site. Cookies can also enable us to target the interest of our users to enhance their experience on our site. Under no circumstances can a cookie identify you as an individual to this or any other site. If you rather not take advantage of the benefits made possible by cookies, most browsers allow you to reject them or to choose which cookies to accept. For further information about cookies please refer to the U.S. Department of Energy, Information Bulletin, I-034: Internet Cookies.